The hype is real in the Star Wars Universe. 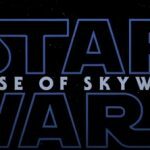 The film will hit theaters in December and will close out the 40 year story of the Skywalker lineage. Ohhhhhhhhhhhhhhhhh man, there is so much to really take away from this teaser? Let me see if I can list out some of the hype. Luke maybe returning as Ghost image? Potential visit to Endor and seeing the remains of the Death Star? This teaser has A LOT to chew on, and I can’t wait until December!